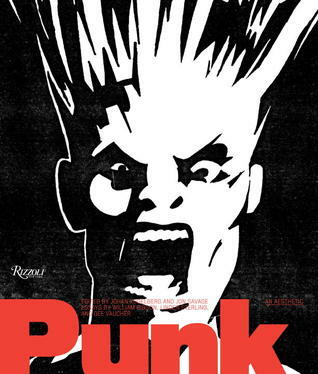 "Punk: An Aesthetic" is a monumental curation of anecdotes, ephemera and photographs from the all-too-brief, yet white-hot punk movement of the mid-late 1970s. Music and other conventions - politics, social mores, etc. - were undergoing a sea-change, and the nascent punk movement pounded them into the public consciousness with the fury of a pile-driver. Musically speaking, punk, which captured the imagination of youth on both sides of the Atlantic, was the boiling over of their intense feelings of helplessness and resignation - the "no future" crowd. But upon further examination, its development and rise to public consciousness was more complex than it appeared on the surface. A fascinating look back at the aesthetic that inspired and was used during the original punk rock movement in the United States and United Kingdom. There are a couple essays included in this, but the highlight is seeing the reproductions of the show fliers, fanzine pages, album covers, and so on that were a staple of punk rock. Everything is reprinted on wonderful glossy, heavy stock paper so you don't lose any details in the images. This is a must have for anyone with any interest in the history of punk rock or the art style of that era. Excellent -- just what I want to see in a look back on the origins of punk: a couple expertly written essays and a deluge of gritty artifacts. This magical compilation is everything you ever needed to see in terms of punk aesthetic, fashion, culture, and what punks have to say. Astonishing. Not just the artwork but the essays and level of intelligence.